The IWC organises two major fundraising events, in addition to Regular Club Events, each year in support of our charities. Both have become highlights of the Moscow social calendar. In addition, we lend our support to other occasional fundraising events, in partnership with other organisations. We publish these events under Events Page as Non IWC Events. 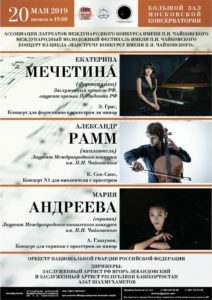 The International Women's Club of Moscow together with the Association of Winners of the International Tchaikovsky Competition is pleased to invite you to a charity concert dedicated to the anniversary of the Club, which will be held in the Grand Hall of the Moscow Conservatory on May 20, 2019 at 19:00, at Bolshaya Nikitskaya str 13/6. In one of the most famous concert halls in the world, at our concert you can listen to the honored artists of the Russian Federation and the Winners of the International Tchaikovsky Competition. All funds received from the sale of tickets will be used to help children in need, children living in orphanages, and people with disabilities.